Most of the time, quiltmaking is a solitary activity. Quilters work individually on their projects and show them to family members, to friends, at their guild meetings or to the recipient upon completion. There was a lot I learned and gained from working on a team project, or a Team Challenge such as this one, that I'll recap below. But first, I must mention the other important component of the Brown Bag Challenge. A Quilt Journal—the conduit for communication and documentation—accompanied each bag through the journey. Most of the participants signed, dated and wrote entries in the journals as the bags progressed through each one's hands. 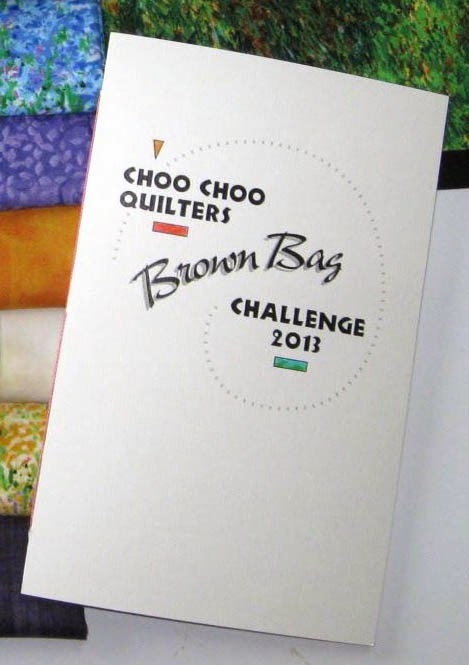 A Quilt Journal was included with each Brown Bag Challenge project. As someone who enjoys knowing the creative thought process behind a piece of artwork, the content of the journal is valuable and important to me. So a heartfelt "Thank You" to those who took the time to write something. 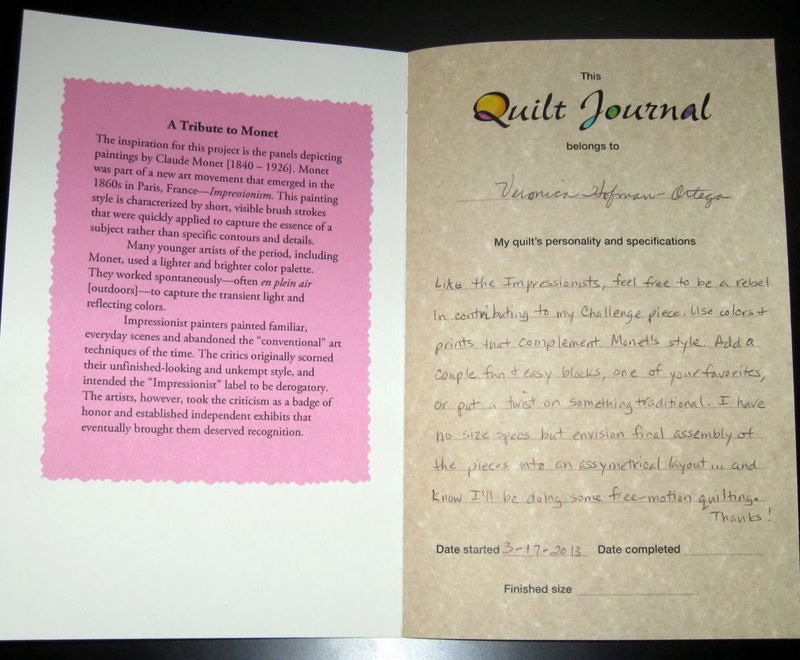 The journal preserves this documentation as well as the personal story of these quilts. Can you remember your initial vision for a project after 7 or more months have passed? I can't— not all the details and nuances, anyway. 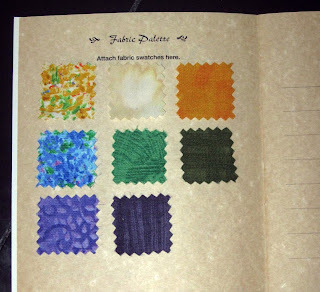 Owners and participants pasted fabric swatches in the Journal. had their quiltmaking and block drafting skills sharpened. Each month brought new opportunities for collaboration—with new co-participants, totally different materials, and a brand new theme. (Kinda like a Project Runway team challenge... only with a lot less drama!) And most everyone said they enjoyed the Challenge and would be interested in doing future group projects like this. As part of a team, you rely on your teammates and they rely on you. For this Team Challenge, everyone brought their talent, experience and point of view to each project. Even though an individual might not be able to contribute the same amount to each bag, collectively, the team did justice to every project. Everyone gets a turn at bat and makes the play according to what's on the field and what's on the scoreboard at that time. Sometimes you have to make a sacrifice to advance the runner... and that's OK. The guild built in extra time for when life throws a curve ball and schedules were hectic. And, the final outcome was grand! TEAM = together, everyone achieves more. If you belong to a guild, I hope it offers a Challenge opportunity and you get involved. 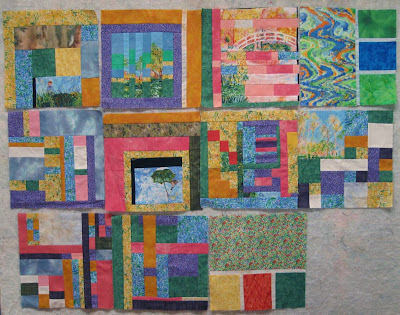 If you don't belong to one, find one in your area, get some friends together and make up your own challenge, or sign up to participate in a Challenge on-line or through one of the quilting publications. My next Challenge? ...working with the free-form blocks that were returned in my Brown Bag. Are they not fabulous?!? Contributions to my Monet-inspired Brown Bag Challenge. To see all the Brown Bag team efforts, visit the Choo Choo Quilters Challenge recap.